On June 29, 2014, which coincided with the first day of Ramadan, the Islamic State of Iraq and Syria (ISIS) declared the restoration of the caliphate. Abu Bakr al-Baghdadi, a shadowy figure with a $10 million price on his head, was declared the new caliph. In its attempt to resurrect the caliphate ISIS is trying to plug into what it sees as the golden age of Muslim expansion and rule. For most people in the West the caliphate is an unknown. It sounds exotic—like something out of A Thousand and One Nights, a topic more suitable for National Geographic than The New York Times. However, ISIS and the newly proclaimed caliphate have taken over large sections of northeastern Syria as well as large sections of Iraq, including Mosul, the country’s second largest city. With efficiency and startling brutality ISIS has terrorized the Iraqi population, thrown the army into chaos and is marching on Baghdad where it threats to slaughter Shiʽites en masse. Clearly the caliphate is back on the world stage. Contemporary information about the caliphate, mediated through the Western media, is a mixture of what ISIS thinks the caliphate was/is/should be, coupled at times with a historical reflection. As is the case in many ideologically motivated recreations of a historical past, the caliphate of ISIS relies on an idealized past, which, if it ever existed, did not exist for a very long time. While it is fair to say that the caliphate started with the death of the Prophet Muhammad in June 632 BCE and continued until it was abolished by Atatürk in 1924, its form, authority and success differed greatly from place to place and time to time. Originally created to maintain the unity and faithfulness of the Muslim community, the caliphate was a cause of division from the start. When the Prophet Muhammad died he left no clear instructions about a successor. Nor was any instruction about his successor to be found in the Qur’an. It was clear to all that no one would succeed the Prophet in his role as Messenger of God. However, he was also the temporal ruler of Medina and the growing Muslim community. There are traditions in both Sunni and Shiʽite traditions about how the Prophet during his lifetime had indicated who was to be his follower in his governing function. However, these traditions are sometimes contradictory and strongly colored by the later traditions of the group from which they arose. Immediately after the death of Muhammad there was a meeting in which Umar, a prominent companion of the Prophet, declared that Abu Bakr, the Prophet’s father-in-law and one of his earliest supporters, should take over governance of the community. There was general agreement and the leading Muslims at the meeting swore the bayʽa or oath of loyalty to Abu Bakr. Even at this time, however, there were Muslims in Medina who believed that Ali ibn Abi Talib, the cousin and son-in-law of the Prophet, should be the leader of the community. This split would later develop into a major division in Islam: Sunni and Shiʽite. Starting with Abu Bakr, there was a series of four caliphs, known as the Rashidun or “Rightly Guided.” Abu Bakr governed from 632-634. He nominated Umar ibn al-Khattab as his successor. Upon the death of Abu Bakr, the leading Muslims swore their loyalty to Umar. Under Umar Muslim armies started the conquest of Egypt and North Africa, Mesopotamia and Persia and the eastern Mediterranean, including Jerusalem. He was assassinated in 644 but not before he had set up a committee of six Muslims to choose his successor. They chose Uthman ibn Affan, a divisive leader, assassinated in 656 by Muslims who felt unjustly treated by his policies. Uthman was succeeded by Ali ibn Abi Talib, whom some thought should have been the caliph from the beginning. From the outset Ali encountered resistance. The family of Uthman accused Ali of complicity in the assassination, an accusation Ali vigorously denied. Ali struggled militarily with Muʽawiyya, a relative of Uthman. Although a truce was concluded between the two, factions of Ali’s supporters were deeply disappointed. Ultimately one of these, a member of the Khariji sect, assassinated Ali in January 661. The first four caliphs are called the Rashidun or the “Rightly Guided.” The implication is that things went downhill afterwards. This is strengthened by the fact that two of Islam’s greatest thinkers, Ibn Khaldun and ibn Taymiyya, held that the true caliphate ended with the death of Ali. Several things need to be noted about the Caliphate of the Rightly Guided. First, each caliph was chosen in a different way: acclamation, appointment, committee, popular vote. Secondly, the oath of loyalty seems to have been essential for validity. Thirdly, none of the caliphs enjoyed total support. Lastly, three of the four were assassinated and in at least two, if not three, instances by other Muslims. Although it was clear that the caliph was not the Messenger of God, his role, authority and responsibilities were not clearly delineated. Nor clearly was his person sacred. Following the death of Ali, the caliphate went to Mu’awiyya of the Umayyad family. The Umayyad Caliphate set up its capital in Damascus and continued the Muslim conquests. Under the Umayyads the Muslim Empire became the fifth largest the world had ever seen. As is to be expected, different caliphs displayed different degrees of piety. While there were caliphs who were pious and concerned about religion, there were others who were decadent and disregarded the rules of Muslim life. The caliphate step by step moved to being an absolute monarchy and caliphs took on increasingly pompous titles such as the Shadow of God and later the Power of God on Earth. 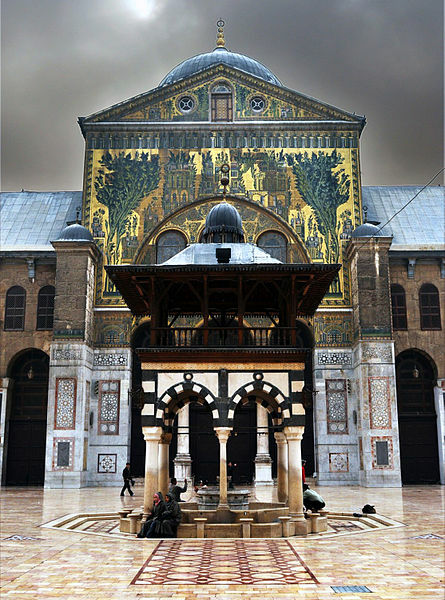 Damascus under the Umayyad caliphs was very different from Medina under the leadership of Muhammad. In the year 750 there was a bloody revolt against the Umayyads by the family of Abbas. The family of Abbas with some justification saw itself as more closely related to the Prophet. The Abbasid Caliphate lasted from 750 until its destruction by the Mongols in 1258. (It should be noted that at this period there were two other competing caliphates: the Umayyad Caliphate in al-Andalus (Andalusia in Spain) and the Fatimid (Shiʽite) Caliphate in Egypt.) The first two centuries of the Abbasids were a golden era for learning, art and literature. The wealth of the caliphate was legendary and there were some very outstanding caliphs. By the 9th century, however, the office of the vizier began to emerge and the caliphs moved further into the background until by the middle of the 10th century the caliph ceased to exercise any real power at all. Viziers and sultans from differing families and ethnic groups such as the Buyids and Seljuk Turks were the true power behind the throne in the last centuries of the Abbasid Caliphate. Finally the Mongols under Hulagu swept across the region and laid siege to Baghdad, reportedly slaughtering its 800,000 inhabitants. Fearful of divine punishment if he shed the blood of a descendant of the Prophet, Hulagu the caliph wrapped in a carpet and trampled to death by horses on Feb. 20, 1258, bringing the Abbasid Caliphate to an end. The Ottoman Empire began under Osman I (1258-1326) and ended with the declaration of the Turkish Republic on Oct. 29, 1923. The Ottoman Empire conquered Constantinople in 1453 and conquered the Balkans, parts of Central Europe as well as the Middle East and North Africa. One notices that the ruler of the Ottoman Empire is the Sultan. The traditional titles of “Caliph” and the “Commander of the Faithful,” do not appear in official Ottoman documents, coins or inscriptions. There is good reason for this. The Umayyads, the Abbasids and the Shiʽites argued over whose family line was closest to the Prophet. A bloodline to the Prophet was important and is still important today among Muslims. The Ottomans, on the other hand, were Turks and not Arabs and descent from the Prophet was not something they could credibly claim. Nonetheless, in its relationship to the outside non-Muslim world the Ottoman Empire began to describe the Sultan as the Caliph. This is seen most often when referring to Muslims living under Christian rule. The caliph becomes a type of spiritual leader of Muslims who did not live under his political rule. This was a totally new development which first appears in 1774 in a treaty between the Ottomans and Russia. As the empire slowly decayed, Sultan Abdul Hamid II declared himself caliph in about 1880. After the defeat of the Ottoman Empire in World War I, the Republic of Turkey was declared on Oct. 29, 1923, and the caliphate was constitutionally abolished on March 3, 1924. The abolition of the caliphate set off a flurry of research among Muslims about the nature and necessity of the institution. The most radical response was that of Aly Abd al-Raziq in his work Islam and the Foundations of Government (1925) in which he argued that Islam did not favor any one particular form of government over another and that the caliphate was not part of the worldview of the Qur’an. Al-Raziq’s work was widely condemned but—to the best of my knowledge—never refuted in a scholarly academic way. There is, however, a much greater amount of literature that would look more or less favorably on the caliphate. The Return of the Caliphate? With the rise of jihadi movements and the turmoil unleashed by the so-called “Arab Spring” there has been renewed interest in the caliphate. Calls for the restoration of the caliphate are issued by different—often violently competing—groups in Syria and now in Iraq. As with most slogans, these calls lack historical depth. The caliphate is not a univocal term. The Caliphate of the Rightly Guided is not the same as the Umayyad, Abbasid or Ottoman Caliphates, to say nothing of the Shiʽite Fatimid Caliphate. The caliphate did not develop in any clear trajectory over the centuries and it has never been clear what the precise function and authority of the caliph might be. While there were periods of great wealth, learning and glory in all of the major historical caliphates, each of them ultimately saw the caliph reduced to a figurehead with no real power—political or religious. It is not clear today what support the Caliphate has among Muslims. From almost the outset, the caliphate has been a Sunni institution. After the death if Hussein ibn Ali in the year 680, Shiʽites have denied the legitimacy of the caliphate. Shiʽites—who make up some 15 percent of Muslims worldwide—would strongly oppose, therefore, a caliphate especially one as envisioned by Sunni jihadis. Even among Sunnis I suspect that the situation is far more complicated than it might initially appear. While I think few Sunnis would openly oppose the notion of a caliphate, many would opt for more constitutional, democratic societies. It is interesting to see the evolution of the names and titles that Abu Bakr al-Baghdadi has been using in his rise to the Caliphate. His name is Ibrahim Awwad Ibrahim Ali al-Badri al-Samarra’i. Abu Bakr al-Baghdadi is his nom de guerre, taking on the name of the first Rightly Guided Caliph. Recently he has gone by Abu Bakr al-Baghdadi al Husseini al-Qurayshi, the last two names being attempts to link his lineage with that of the Prophet and his tribe the Quraysh. Most recently he is using The Commander of the Faithful Caliph Ibrahim, using the traditional and oldest title of the Caliph. It is probably important to distinguish between ISIS and the newly resurrected caliphate. ISIS remains a brutal and powerful force in northeastern Syria and northern Iraq. To some extent it aligns itself with the grievances—often justified—of the Iraqi Sunni population. As such ISIS probably does enjoy some support among Iraqis if, for no other reason, than that it is the most effective opposition to the government in Baghdad. Whether one can transfer the support of Iraqi Sunnis for ISIS as opposition to the government in Baghdad to support for a resurrected caliphate does not seem to be warranted at this point.
" While it is fair to say that the caliphate started with the death of the Prophet Muhammad in June 632 BCE ..." I'm going out on a limb here but I'm going to say that should be CE, not BCE. Frankly, I, for one am deeply offended by the use of C.E and B.C.E. in place of B.C. and A.D. I find it one more slight against Christians and a grave insult to the Jesus, the Christ. Elias D. Mallon, S.A., is external affairs officer with Catholic Near East Welfare Association.